MG-5IIB semi-automatic stretch blow molding machine is an ideal equipment to produce types of PET bottles for mineral water, juice, carbonated drink and edible oil, ect. 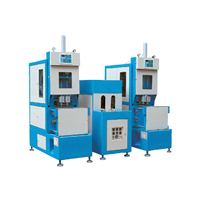 Two stretch blow molding machines share one drying tunnel so that it is compact in size, productive and energy saving. All of those factors make it be the best choice of various plastic bottle productions. Output capacity up to 950BPH for 0.1L using two-cavity blow mold. Heating lamps are adjustable in directions to suit various preforms. Simple installation & startup adjustment.